Tablets are mobile devices that have a touch screen and are more portable than a laptop computer. Most of these devices can be connected to WiFi or a data network for work. Most of these tablets are not as powerful as a laptop or computer but can be used similar to one and provide entertainment. Tablets have been in development in the last decade and have been a popular choice for entertainment and work in place of a computer. At California Electronics Recycler we offer tablets and eReaders recycling. Why Should You Recycle your Tablets and eReaders? Tablets and readers contain various materials that are precious and should be recycled to prevent them from ending up in landfills. They may also contain materials that are harmful such as materials that make up rechargeable batteries. These harmful materials can be found in our water, air and soil supplies if they are disposed of in landfills. If you have tablets or eReaders that need to be recycled or disposed of there are several actions that you can take to do your part to keep them out of landfills. 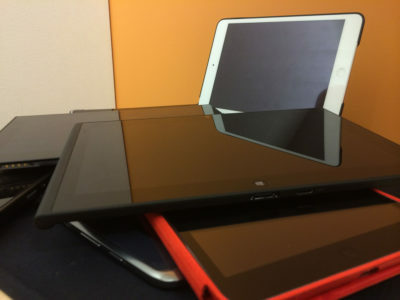 You can try to resell these devices, donate them, or bring them to our recycling facility. Through resale of your tablets you may be able to recover some of the costs. Donating tablets and eReaders allows those without to have access to the internet and obtain information they may need for education or work. If they are too slow or inoperable it may be wise to bring them to a responsible recycling center such as California Electronics Recycler located in Santa Ana, CA. If you have tablets, eReaders, or mobile devices that need to be recycled bring them down to our drop off location or call California Electronics Recycler at (800) 282-3927 today. You may be eligible for a free business pickup.